With the ever-increasing number of compounds that need to be monitored at low concentrations in a wide variety of complex food commodities, pesticide residue analysis in food has become a more challenging task. There is a need for qualitative multi-analyte screening strategies that are capable of efficiently detecting residue violations to protect consumer safety. Because food commodities are sourced from a global network supply chain, a pesticide residue screening strategy should be considered from a global perspective. Countries have different regulations regarding the authorization of pesticides and Maximum Residue Limits (MRLs) established and subsequently methods must be developed to satisfy domestic, import and/or export requirements. Over the last decade LC/MS has become the predominant approach for the analysis of small organic molecules, such as pesticide residues in foods. Multi-residue analysis utilizes generic sample extraction and chromatographic methodology; hence the analysis of very complex mixtures remains a challenge that the residue analyst has to deal with on a day-to-day basis. 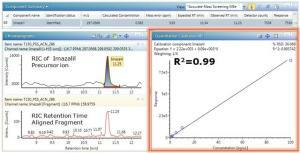 Full spectra acquisition and the specificity of accurate mass measurement have been well characterized. They have been used in combination with time tolerances, isotopic matching, fragment ions/ratios, and response thresholds to help reduce false positive and false negative identifications in screening assays. The difficulty in detecting some compounds at the low levels required means that further sensitivity enhancements of screening methods would help improve mass spectral data quality in order to avoid compromised precursor ion or fragment ion information, and ensure high mass accuracy below the legislation levels. Advances in Waters’ mass spectrometry technology have vastly improved sensitivity for full spectral analysis The drive to improve and develop new technology solutions continues in order to meet the ever changing requirements of residue analysis and more stringent regulations. Waters recently introduced the ionKey/MS System, which incorporates microfluidic UPLC separation into a mass spectrometer source, providing enhanced sensitivity and selectivity and a simplified user experience. All microfluidic, gas, and electrical connections are automatically engaged when the iKey Separation Device is inserted into the source enclosure and the handle is turned locking it into place. 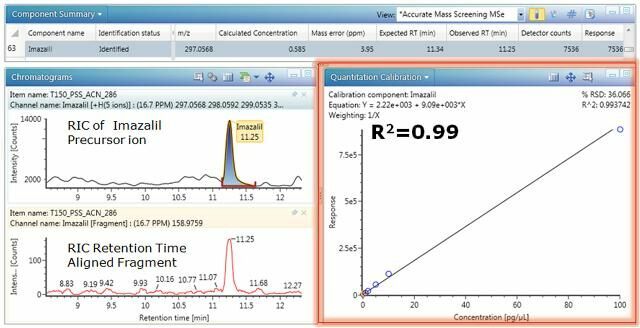 Data are acquired with MassLynx Software and processed with the UNIFI Scientific Information System, which has been specifically designed for non-targeted accurate mass screening applications. Reconstructed ion chromatograms (RICs) for imazalil precursor/fragment ions in mandarin matrix and linearity plot showing a linearity correlation coefficient of R2= 0.99 using ionKey/MS. ionKey/MS offers the unique ability to dilute sample matrix and still obtain excellent response and signal-to-noise (S/N) of analytes. It might even be possible to reduce the need to closely matrix match QC samples to the test samples by introducing large sample dilution factors to negate the matrix load, and thus benefit from efficiency savings. ionKey/MS also provides a major improvement in data quality at and below required legislative limits of detection (LODs). For the analyst, the advanced design of the ionKey Source delivers the benefits of microfluidic chromatography to a routine analytical platform for both research and surveillance monitoring purposes. In this recently published application note, Mike McCullagh et. al. explore the full benefits of iKey microfluidic chromatography combined with time-of-flight (Tof) mass spectrometry for residue analysis purposes.